Wispy Bees are one of the bees from the Thaumic Branch. Wispy Bees produce Silky Combs (and, by extension, Silk Wisps) at a rate which is about 50% faster than that of Tropical Bees and at about the same rate as the rare and season-dependent Leporine Bee. However, it requires quite a bit more work to acquire, requiring mid- to high-tier bees in its resultant mutation. They also produce Silk Wisps directly as a specialty product. Their effect, Wispy, spawns Wisps near the Apiary or Alveary in which they reside. 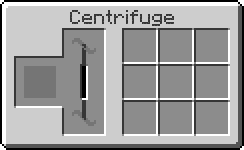 This can pose a great danger to the owners of the bee, but it also allows for farming of decent-quality items for turning into Essentia. It is currently unknown whether the spawning of Wisps by these bees disperses the Flux in nearby Nodes. Wispy Bees produce Silky Combs. These result in Silky Propolis and Honey Drops when centrifuged. 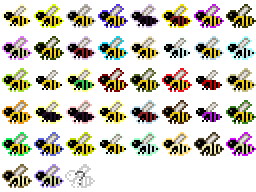 Pure Wispy Bees require a Normal Climate and Normal Humidity to start working, and at least one Magic Flower, either a Shimmerleaf or Cinderpearl. 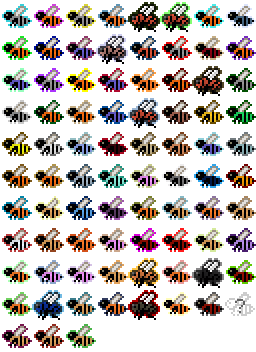 Like all species, their traits can be modified through Bee Breeding. The traits below are correct for purebred Wispy Bees. The Wispy Bee has no further mutations. This page was last modified on 8 August 2018, at 16:56.